Early Chicago Skyscrapers is part of the Tentative list of USA in order to qualify for inclusion in the World Heritage List. All nine sites of this serial nomination can be covered in a 30 minute walk, in fact several of these iconic early skyscrapers are adjacent to each other. I visited each without too much difficulty, however there are different levels of satisfaction. For example, some structures have little value remaining within as the interior has either been changed, significantly altered, or completed gutted. For visitors, there are 2 wonders included in this nomination that perhaps justify inscription together, regardless of the other sites. 1) Rookery Building (1888) This structure is the gem of the ensemble and is note-worthy for both its exterior and magnificent interior lobby. The later was redesigned by a rising star at the time, Frank Lloyd Wright, who in 1905 was in his late 30's. The interior really is stunning. In addition, there is a Frank Lloyd Trust office and store in the lobby with handy FLW architecture maps of the Chicago Metropolitan area. 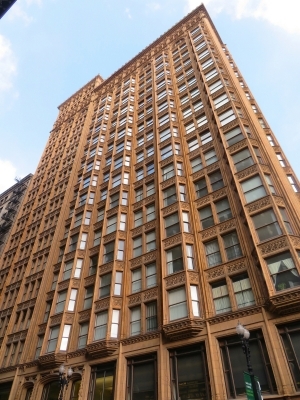 2) Marquette Building (1895) This is a must-see component of the Early Chicago Skyscrapers nomination. The front entrance is adorned with scenes of Chicago History. The History of Chicago and the Great Lakes region are even more richly adorned in the lobby, which is open to the public. Visitors are rewarded after exiting the lobby going straight past the National Historic Landmark sign to an informative display about the Chicago School or Architecture. Interesting panels about the History of the Marquette Building and this period of construction is displayed, providing excellent context to the overall scope of the nomination. 3) Monadnock Building (1891) You might not be rewarded with the same grandeur upon entering, but the Monadnock building is rewarding for its atmosphere and authenticity. Walking into the building, I felt like I crossed a threshold into Chicago at the turn of the 20th century. Old-fashioned hat shops, shoe shops (manufactured on site), and other businesses harness back to era of 'old' Chicago. Like the Marquette Building, you can walk straight through the building, crossing a block without braving the potentially inclement weather. 4) Auditorium Building (1889) I only got a hint of this architectural wonder. Unless you purchase a ticket to a performance, you will be hard-pressed to fully enjoy or appreciate this component of the nomination. A young apprentice (Frank Lloyd Wright) played an import role in shaping the beautiful interior of the theatre. While I explored the exterior, I'll make sure upon my next visit to book a musical or theatrical performance well in advance. The remaining five sites are note-worthy for their well-preserved exterior. However, for the most part their interiors are unremarkable and in the case of the Fisher Building restricted to tenants. I certainly enjoyed seeking out the buildings and observing the architectural elements that define the period, but a few minutes each will be sufficient.